Deja atrás las calles de Dubai en esta aventura del desierto definitiva. 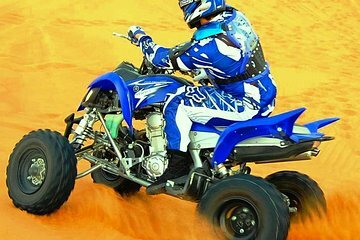 Viaja en camello, ataca las dunas en un 4x4, experimenta la emoción del quad y aprende a esquiar en la arena con tu guía experto. Esta excursión de medio día es ideal para aventureros y destaca lo mejor de los deportes al aire libre de Dubai. Escápate de las calles de la ciudad y experimenta la belleza del desierto. Grupo pequeño, excursión de medio día que garantiza un servicio personalizado. Really bad bad... We started with sand duning. All and I mean all of us felt bad. After 5 min a women vomited. After some minutes later next did the same. The driver took it easy. But to get out of the sand we had to cross all dunes to come to the road. When we reached the camp we had to cross dunes again for 10 min. More vomiting... When we reached the camp, there where no lights at toilet. So me and my son couldnt do the ATM, the sand skiing or the camel ride. It took us a half day to get good after this. And we wasnt offered to come back to do the things at the camp wich we couldnt do because of illness. A really waste of money! This tour was better than I had expected. The driver picked us up from our hotel and took us out to the desert along with 4 other people. We went sand duning in a Land Cruiser very thrilling!, sand surfing, ATV riding, and camel riding. The driver was very patient whenever we wanted to stop and take photos. He was very kind and explained everything along the way. This was the best experience ever, money very well spent. I will go back to Dubai just to do this again!